Metallic Fades have quickly become one of our most popular collections and it's easy to see why! The shiny fade from blue to silver on this 22" Penny, gives a unique look that no other skateboard can copy. If you want a completely unique look, with no sacrifice of quality, look no further than the 22" Blue Silver Metallic Fade! This Blue Silver Metallic Fade features an electroplated, chip resistance metallic coating that subtly fades from one color to the next. Our road tested, secret plastic formula and lifetime warranty give you the peace of mind that you are getting the quality of an authentic Penny. Smooth cruising 59mm, 83A durometer wheels are paired with lightning fast ABEC 7 bearings to make sure you get where you're going quickly and safely. The wheels are designed to grip the tightest of turns without sacrificing the speed you need. White powder coated trucks complete the theme of this Penny 22" board. The high-quality aluminium construction of Penny trucks keeps your ride light and strong, while the cushions make sure you're ready to carve. Tighten them or loosen them to suit your riding style. 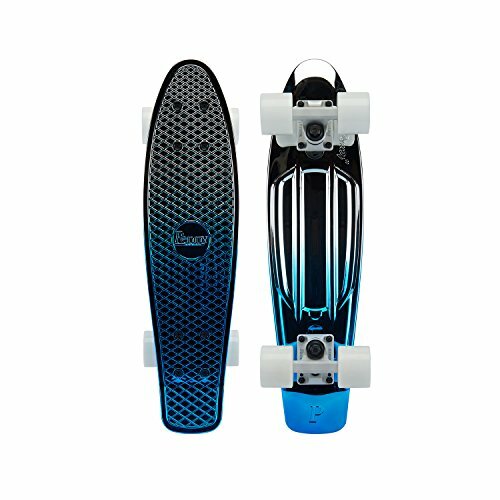 The 22" Blue Silver Metallic Fade features black high tensile deck bolts. Official Penny Skateboard - Blue Silver Metallic Red, 22"
View More In Standard Skateboards. If you have any questions about this product by Penny Australia, contact us by completing and submitting the form below. If you are looking for a specif part number, please include it with your message.